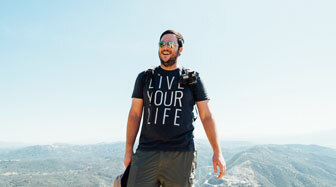 I am a huge fan of the San Luis Obispo / Pismo Beach area of California. 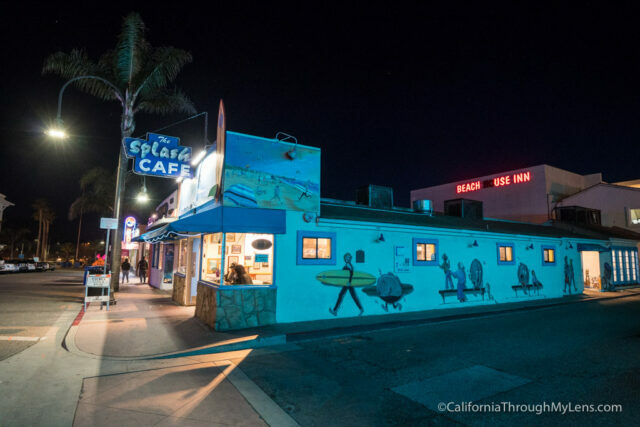 Not only are they quaint beach towns but they have a laid-back vibe and a great community of people and adventures that will get you excited to wake up every morning when visiting. 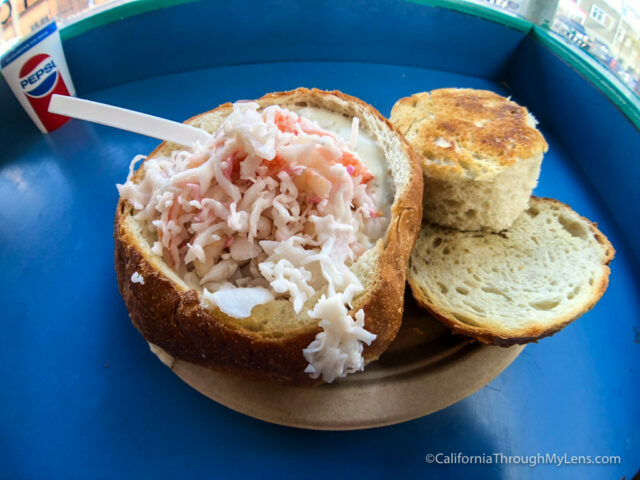 However, no trip to this area is complete without a bread bowl from my favorite clam chowder (with seafood topping) in all of California, Splash Cafe in Pismo Beach. Here is all the information. 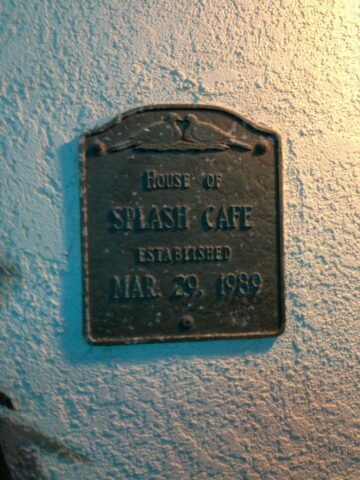 In 1991, Joanne and Ross Currie purchased Splash Café in Pismo Beach just before the annual Clam Festival in October. 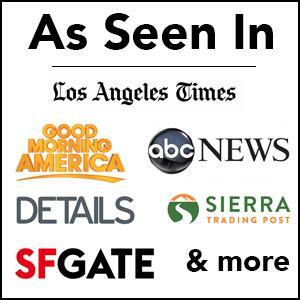 That incredibly busy beginning was the start of a 20+ year journey that has seen the Curries improve the clam chowder recipe that is now award-winning and world-famous. They have also expanded to a second location in San Luis Obispo, distributed in Costco stores and other restaurants and started a gourmet catering division. 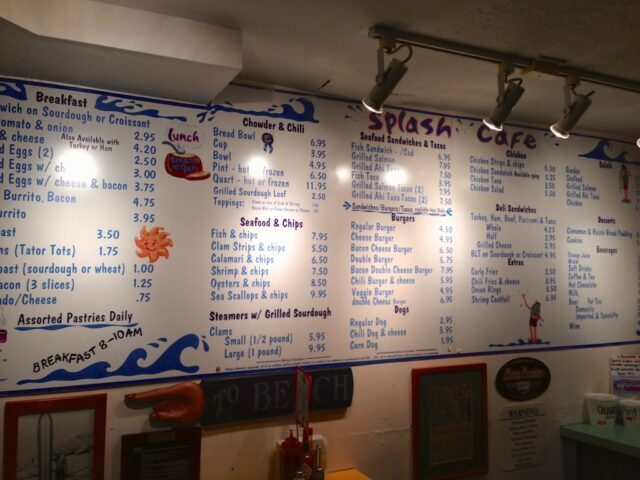 It’s Splash Café’s customer loyalty and their insistence on using the highest quality ingredients that have caused chowder sales to grow from 5,000 gallons a year in 1991 to 30,000 gallons a year today between the two restaurants. Now it never fails, but whenever I happen to visit this small little cafe, I always seem to find a line out the door and around the side. This is the first sign that shows you good it is. 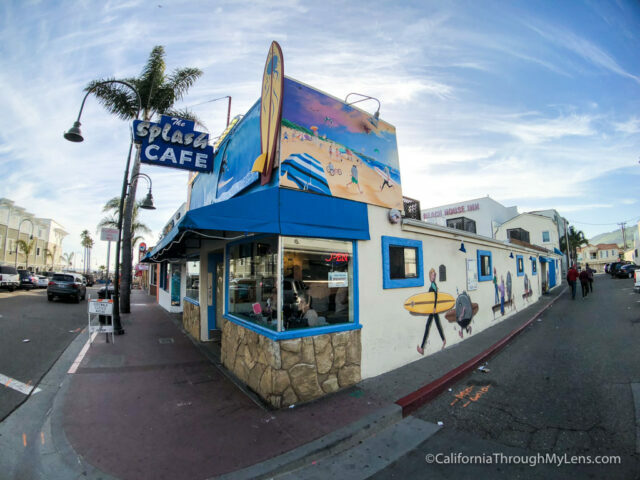 After jumping in line, you will often hear all of the regulars talking about how they come here a couple of times a week, in addition to out of towners that were told a 50-mile drive to Splash is well worth it and have happened to try it for themselves. 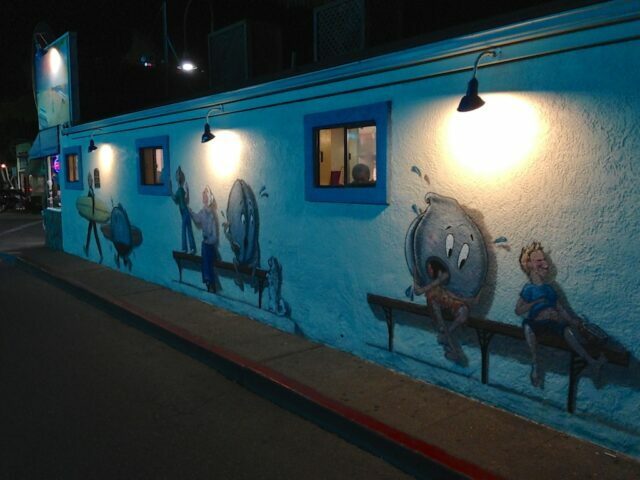 Either way, no matter how long you wait, after tasting their chowder you will gladly wait in line the next time you come. 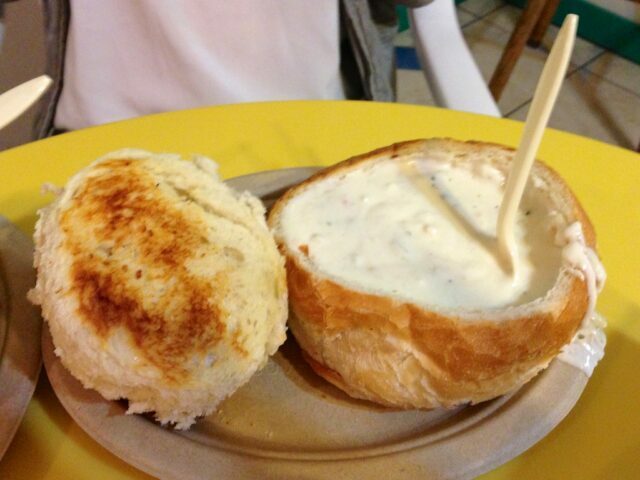 Now while they have a lot to order, if it is your first time, you need to get the clam chowder bread bowl. I mean if they sell over 30,000 gallons a year nationwide they must be on to something, right? I prefer mine to have the seafood topping which is around a dollar extra I believe and adds a combination of crab and shrimp to the top of an already fabulous soup. Even if that is not your cup of tea, a traditional bread bowl will not steer you wrong. When it arrives at your table, the bread has been hallowed out, and the top has been grilled with a little butter to give you the perfect roll to dip into your bowl. The clam chowder is creamy and flavourful, and it always fills me up. That doesn’t stop me from trying to eat the bowl as well (I have yet to conquer it fully, but I can get close). There never seems to be enough seating in this cafe so after filling up on the clam chowder there is usually someone who wants your seat. That is ok though if you are anything like me you will be sufficiently full and happy from the culinary adventure you just went on, and you will be excited to let someone else experience it as well. 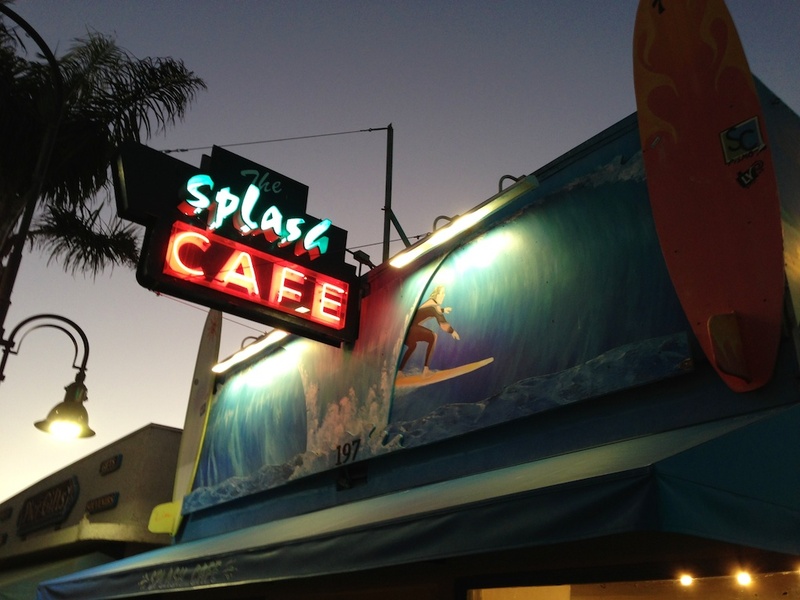 Now San Luis Obispo has a Splash Cafe as well, and it is also great, but for the experience, you need to try the main one in Pismo Beach at least once. I do hope you like it as much as me, but I have little doubt of that as everyone I know that has gone here has left happy. Leave me a comment if you know of a better clam chowder place or get directions below to go yourself.